Zaaschila real Mexican salsa brings this creamy chipotle salsa spread that is great on salads, sea food, nuggets, gyros, pizza, sushi, french fries, sandwiches, pasta, sweet corn, and more. 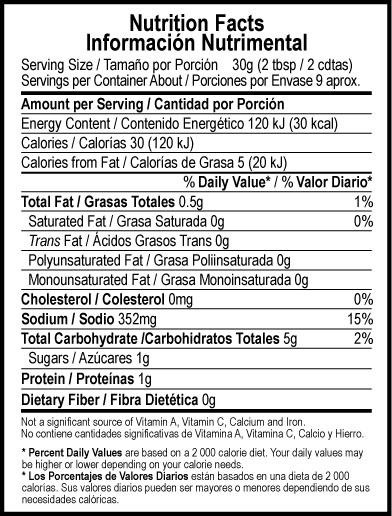 Ingredients include water, chipotle peppers, iodized salt, acetic acid, vegetable oil, whey protein concentrate, jalapeno peppers, red tomatoes, onion, modified corn starch sugar, condiments and spices. Las salsas cremosas picantes Zaaschila son muy sabrosas en ensaladas, con mariscos, nuggets, gyros, pizza, sushi, papas, sandwiches, pasta y elote. La marca "Z" Zaaschila elaborada por Alimentos Tres G de Monterrey, NL Mexico desde 1997. I love it, i use it on most anything, eggs, meat sandwichs salads beans try it you will love it to. My favorite Sunday mornings start with scrambling eggs with Chorizo, melting some cheese on top, and finishing with this sauce. The smoky, creamy, tangy combination is perfect!! This is a great chipotle sauce that has a great tangy and smoky flavor with a smooth cremosa finish! I use this sauce in sandwiches and tacos of all sort. Not as hot as other sauces in my collection, but so tasty and perfect for anyone's heat tolerance. Put it on every bite of every meal, you won't be disappointed! I bought this in Mexico in May, never tried it before. When I got home we fell in love with it, and then panicked where to buy it as I only brought three bottles home. Love it on almost everything! Thanks to mexgrocer I can order it at any time I need it! My number one condiment! It's great on everything from sandwiches, to fish, to egg burritos, to salad dressings. It's smoky, creamy, and has enough heat to please enthusiasts without killing the palate. I keep an extra bottle in my cupboard so that I don't run out. oKay.., it's a toss-up now, as to which of these sauces is my all time fave. The Chipotle Creamy Salsa on Mac'n Cheese is KILLER!!!!! This is great mixed with Ranch Dressing. It gives your salad a spicy taste which is great. It is good on everything I have tried it on. This has quickly become my favorite go-to spread. Like the previous reviewer said, it's fantastic on many different kinds of foods, even non-Tex-Mex foods like hot dogs, although I like it best on breakfast burritos. It's got a great kick and so much tastier than plain hot sauce. We had this at a breakfast restaurant in Isla Mujeres. WOW! It is so good. We searched everywhere for it the 2weeks we were in Mexico and couldn't find it anywhere. Smokey, sweet with a big spicy bite! YUM! Great on eggs, chicken, shrimp, sandwiches, veggies, rice, pasta, .... TRY IT!